Whether reporting your passport lost, stolen or damaged you will need to fill out a DS-64 form. You can obtain this form online or from an Acceptance facility. You will need to complete this form by hand and use only black ink. Be sure to answer all questions and write legibly, if you have lost your passport and do NOT know your passport number fill in all zeros. When the form is complete you will need to sign and date it. 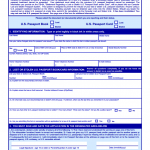 If you are also replacing your passport you will also need to fill out a DS-11 form and submit both forms with the proper documentation.This form will ask for a description of how it was lost and the dates, please explain as best as possible the circumstances and dates that the passport being reported went missing.